Just because you can eat a whole sleeve of Oreos during recess doesn’t mean you should. 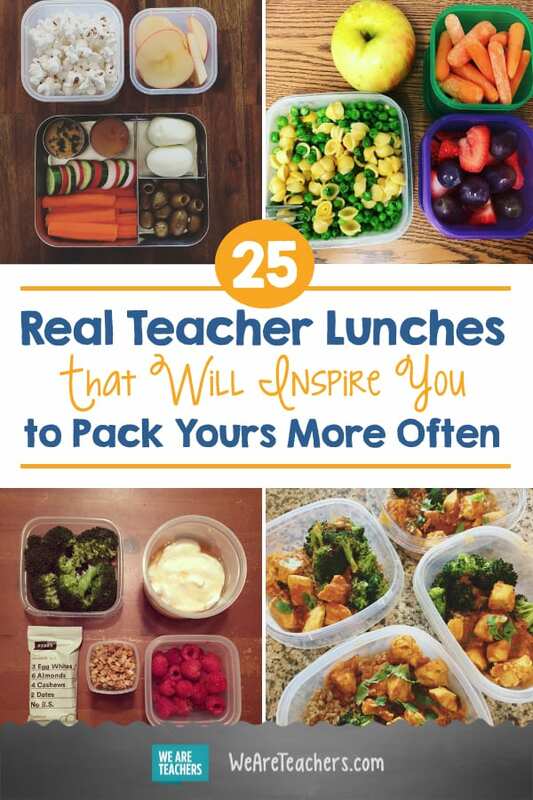 When you’re running from the copier to recess duty and back again, it’s easy to fall back on fast-food teacher lunches and granola bars wolfed down in the car. We get it. That’s why we’re always on the lookout for better ideas that are inexpensive, easy to pack, and nutritious, too. These teachers showed us how it’s done. 1. A homemade pizza bagel. Who says you have to pack a sandwich or leftovers? Snacks FTW. It’s not just for kids! Mix in some peas or broccoli and pack some raw veggies or fruit on the side for a healthy twist. 4. Salads in a jar. You’ve seen them on Pinterest, but honestly they don’t have to be complicated, and they’re a great way to get the veggies in. For when you’re tired of both chicken and tuna salad. Pack some crackers to go with it for an extra special lunchtime treat. 6. A build-your-own yogurt parfait. With veggies and an energy bar on the side. Sold. 7. A whole week of burrito bowls. Why stop at Taco Tuesday? 8. When in doubt, go simple. Simple doesn’t have to mean boring! Sometimes the best lunches are those that rely on easy, wholesome ingredients. 10. Cous cous and veggies. Served cold or warm, this combination makes for a great salad that will also fill you up. Imagine opening your lunch box and seeing this beauty waiting for you. Standing on your feet all day does require carb loading. Meal prep for the week ✅! This protein-packed lunch is guaranteed to keep you from getting hangry before dismissal. It doesn’t get any easier than this. One pita, a little hummus, and a few veggies, and you’re good to go. Rather than go the mason jar route, this teacher packs her salad ingredients in individual containers so that everything is fresh come noon (or 10:30 at my school). 17. A rainbow of veggies. Delicious!! ⠀ 👉🏻Reposting @teacher_lunch_time:⠀ …⠀ "TGIF! @chobani drinkable Greek yogurt, cucumbers, peanut butter @larabar , peanuts, almonds, and craisins, @ritzcrackers , Colby and pepper jack cheese, oranges, and cherries. 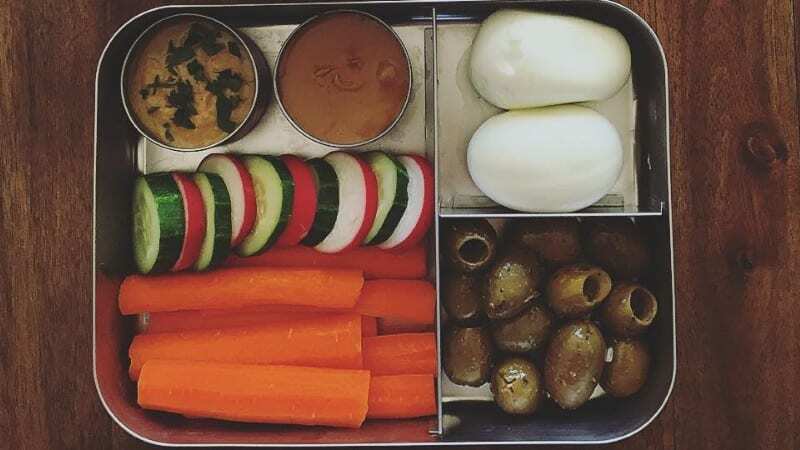 ⠀ .⠀ 👉🏻Container by @EasyLunchboxes⠀ .⠀ #easylunchboxs #helathylifestyle #lunchbox #lunchboxideas #schoollunch #bentobox #teacherlunch #officelunch #worklunch #adultlunchbox #kindergartenteacher #20minutelunch #healthyfood #schoollunchideas"
It’s like your own personal charcuterie platter. 20. Soup with all the toppings. Putting it in a glass bowl helps you feel civilized. 21. Pineapple and black bean salad. What kind of genius came up with this perfect lunchtime creation? I want to be this teacher’s friend. Beats whatever they’re serving in the cafeteria. 24. Beef with brussels sprouts. This easy two-ingredient lunch will have you counting down the seconds until you can eat it. Plus lots of other yummy things … but also, bacon-fat popcorn. What did YOU have for lunch today? Come and share in our WeAreTeachers Chat group on Facebook. Plus, check out our favorite crockpot recipes for teachers.